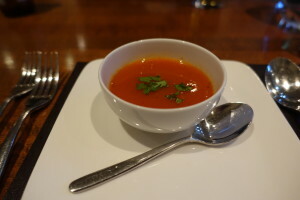 This was the complimentary soup that was delicious, fragrant and sweet. Kinda like a Heinz tomato soup with a twist, forgive me as that was a uni staple for me. Judge away! Grilled Spicy Prawns served with ‘Tenderly’ Salad, Sweet Lime, Mango and Passion Fruit Dressing. £6.95. To be fair it was more sweet than spicy, pleasant enough but not memorable. 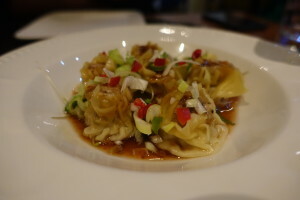 Steamed Hand Crafted Dumplings with Prawns, Chicken and Pork filling served with Sweet Ginger & Tamarind Sauce. £6.95. These were the dumplings served in error, I ate one before realising. I’m glad it was returned as the saggy won ton skins were filled with bland meat. 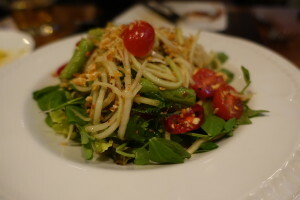 Traditional Papaya Salad with French Beans, Cherry Tomatoes, Ground Peanuts, Salted Shrimps and Spicy Lime Dressing. £6.95. I loved this salad and it was quite possibly the best thing we ate of the evening – it’s everything you’d expect from a decent papaya salad, hot chilli kick, fresh, salty, sweet and with the added textural element from the nuts. It was on point. 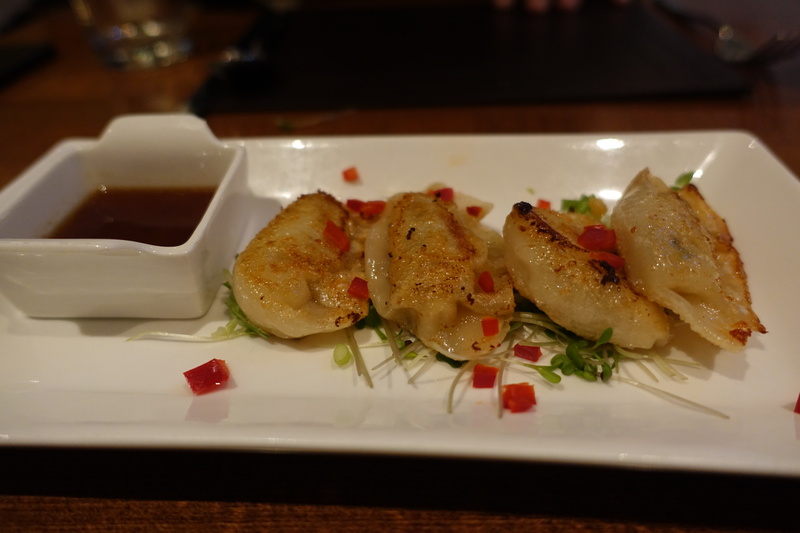 Grilled Hand Crafted Dumplings with Prawns and Water Chestnut Filling, served with Sweet Ginger and Tamarind Sauce. £6.95. I really do get my hopes up when I read things like ‘hand crafted’, but all we could taste was fried dough with an insipid filling. Another waitress who brought them over to us, apologised for the mistake earlier and explained that our waitress who took the order is new. It happens I guess. 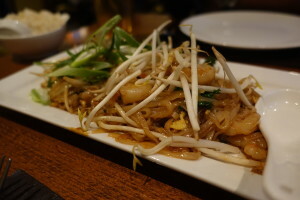 Pad Thai with Prawns. £9.95. 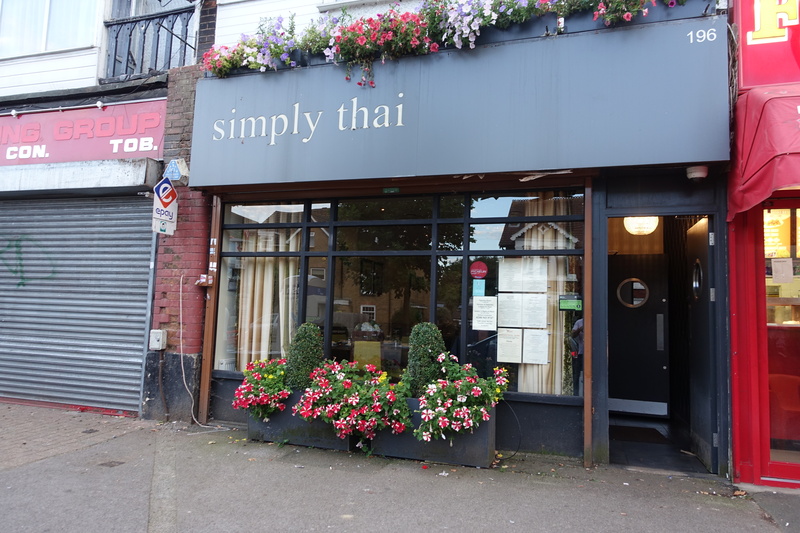 How can you have a Thai meal in suburbia without Pad Thai? 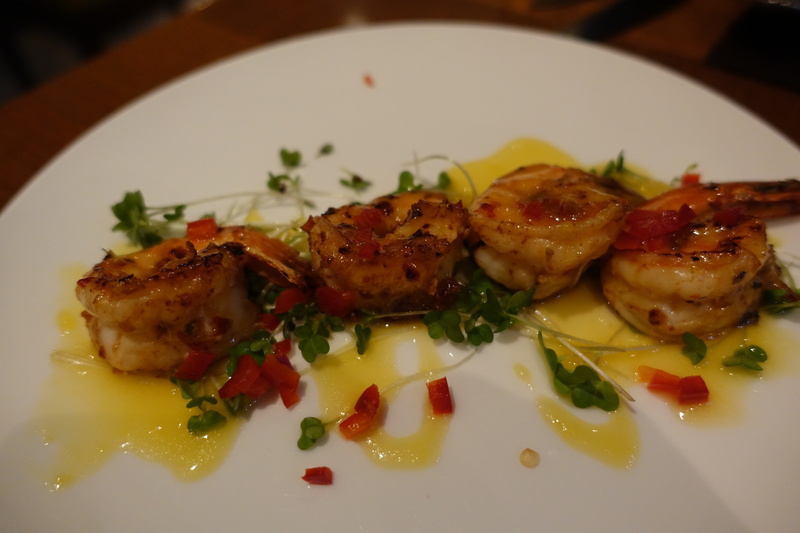 It’s the litmus test to how good the Chef’s work is surely? It’s presented well enough, but was overpowered by palm sugar making the dish desert like, it lacked the smoky lick from a hot wok too. 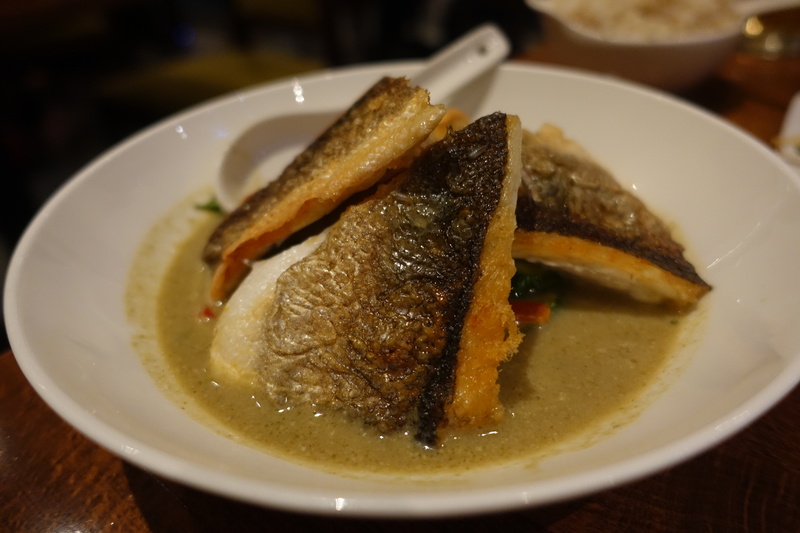 Crispy Pan Roasted Sea Bass on Aromatic Thai Green Curry of Vegetables. £12.95. This is good work from the Chef, crispy skin, hot, fragrant, aromatic green curry sauce. We couldn’t grumble with this one. 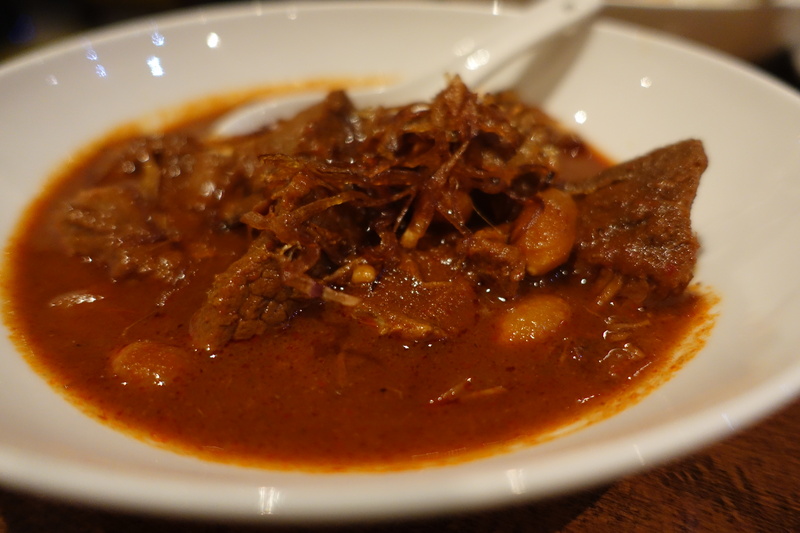 Masaman Beef Curry – Chunks of Beef Slow Braised in Roasted Spices, Whole Peanuts, Seasoned with Tamarind Sauce. £9.95. You’ve probably heard me labour the point of how much I love slow cooking, this one missed the mark though, as all it needed was to be a whole lot less sweet, with a bit more spice. 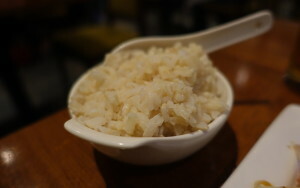 Brown Rice. £2.95. This added a good little base to soak up the Masaman but at almost 3 quid a pop you’d expect a bit more than a dinky little bowl! 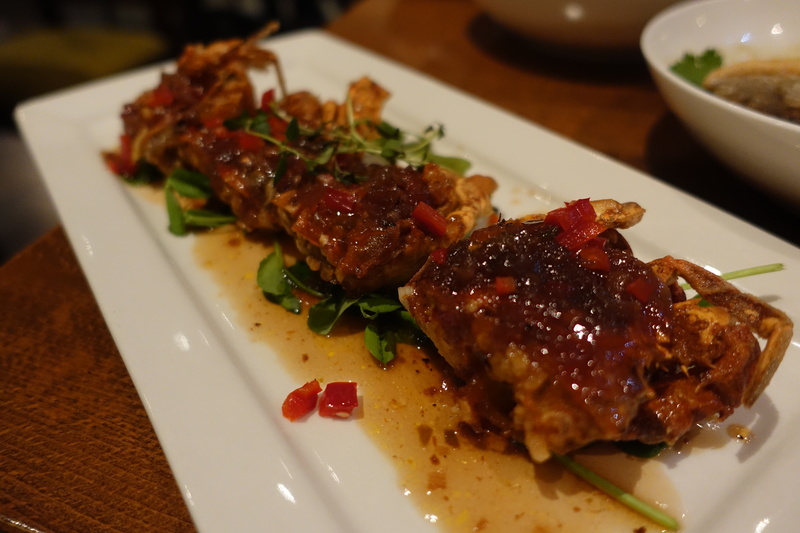 Crispy Soft Shell Crabs served with Chef’s Special Blend of Spices, Palm Sugar, Lemon Grass & Tamarind Sauce. £13.95. These were perfectly edible but little crabs slightly overpowered by the palm sugar. Washing them down with Singha (£4 per bottle) just worked! 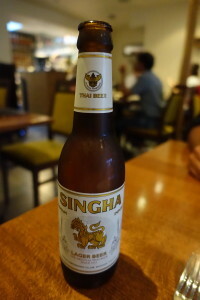 The damage: We paid a smidgen over £100 for 2 with service and 5 bottles of Singha. The good: Patria Weerapan tells a very charming story, her Crispy Seabass is a winner as is her Papaya Salad and complimentary soup. It’s quite astonishing that she does all the cooking herself, respect to you! 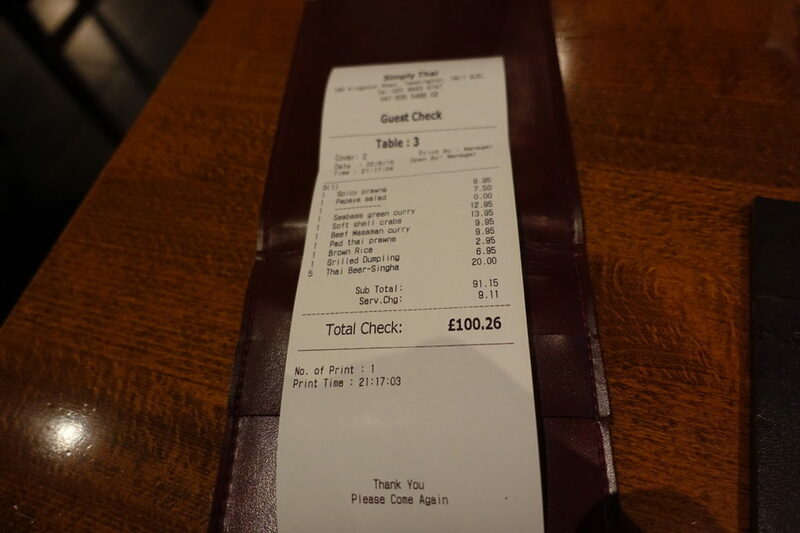 The bad: We waited 20 minutes before our food and drinks order were taken – this requires ironing out as with the muddle up of bookings, I felt sorry for the young mum. I can empathise with our waitress learning ‘on’ the job but at least do some learning before the job. Expect some delays for the food as bear in mind it’s only Chef Weerapan cooking. It’s a pricey joint for suburbia too and please go easy on the palm sugar, who am to judge though as the flavours are most probably geared towards the western palate!